I am an associate professor in the School of Electrical Engineering & Computer Science at the University of North Dakota. The 2019 International Conference on Engineering and Natural Science-Bangkok (ICENS 2019), March 15-17, 2019, The Landmark Bangkok, Bangkok, Thailand. The 2018 International Conference on Engineering, Technology, and Applied Science (ICETA 2018), June 25-27, 2018, The Grand Hotel Taipei, Taipei, Taiwan. The 2018 International Conference on Engineering and Natural Science (ICENS 2018), January 30 - February 01, 2018, Sapporo, Hokkaido, Japan. The 2017 International Conference on Engineering, Technology, and Applied Science – Fall Session (ICETA-Fall 2017), November 7-9, Fukuoka, Japan. The 2017 International Conference on Engineering and Natural Science – Summer Session (ICENS-Summer 2017), August 23-25, 2017, Sapporo, Japan. The 2017 International Conference on Engineering and Natural Science (ICENS 2017), January 19-21, 2017, Bali, Indonesia. The 2016 International Conference on Engineering, Technology, and Applied Science – Fall Session (ICETA-Fall 2016), Seoul Olympic Parktel, Seoul, Korea, November 7-9, 2016. The 2016 International Conference on Big Data, IoT, and Cloud Computing (BIC 2016), Chiang Mai, Thailand, August 23-25, 2016. The 2016 International Conference on Engineering and Natural Science – Summer Session (ICENS Summer), Kyoto, Japan, July 12-14, 2016. The 2nd International Conference on Business and Internet (ICBI 2016), Taipei, Taiwan, April 22-24, 2016. The 2nd International Conference on Engineering, Technology, and Applied Science (ICETA 2016), Taipei, Taiwan, April 22-24, 2016. The 3rd International Conference on Engineering and Natural Science (3rd ICENS), Bangkok, Thailand, January 19-21, 2016. The 2015 International Conference on Engineering, Technology, and Applied Science—Fall Session (ICETA 2015-Fall), Nagoya Congress Center, Nagoya, Japan, November 10-12, 2015. The 2015 International Conference on Big Data, IoT, and Cloud Computing (BIC 2015), Osaka, Japan, August 23-25, 2015. The 2nd International Conference on Engineering and Natural Science (ICENS 2nd), Tokyo, Japan, July 22-24, 2015. The 2015 Macau Conference on Engineering, Technology, and Applied Science (CETA 2015), Sheraton Macao Hotel, Macau, July 7-9, 2015.
International Conference on Engineering, Technology, and Applied Science (ICETA 2015), Taipei, Taiwan, April 22-24, 2015.
International Conference on Business and Internet (ICBI 2015), Taipei, Taiwan, April 22-24, 2015. The 2015 International Conference on Engineering and Natural Science (ICENS 2015), Bangkok, Thailand, January 21-23, 2015. Mark Fienup, Tom O’Neil, and Wen-Chen Hu, editors. 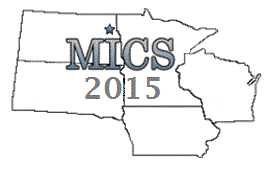 Proceedings of the 48th Annual Midwest Instruction and Computing Symposium (MICS 2015), Grand Forks, North Dakota, April 10-11, 2015. Including 39 articles and topics of undergraduate research, cloud/big data, mobile/web/database/scientific applications, distributed computing, computer science education, software testing, security, academic network administration, tools for teaching, algorithms, artificial intelligence, systems and control, etc. Naima Kaabouch and Wen-Chen Hu, editors. Handbook of Research on Software-Defined and Cognitive Radio Technologies for Dynamic Spectrum Management, ISBN: 1-466-66571-8, IGI Global, 2014. It includes 36 chapters, more than 100 authors, and 4 sections: (1) radio spectrum sensing, (2) radio spectrum access and management, (3) software defined radio and antennas for cognitive radio networks, and (4) models, security, and other related topics. 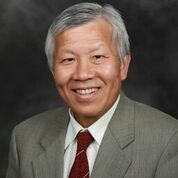 Wen-Chen Hu, editor. Multidisciplinary Perspectives on Telecommunications, Wireless Systems, and Mobile Computing, ISBN: 1-466-64715-9, IGI Global, 2014. Wen-Chen Hu and Naima Kaabouch, editors. Big Data Management, Technologies, and Applications, ISBN: 1-466-64699-3, IGI Global, 2013. It includes 17 chapters, 60 authors, and 4 sections: (1) big data technologies, methods, and algorithms, (2) big data storage, management, and sharing, (3) specific big data, and (4) big data and computer systems and other topics. Wen-Chen Hu and S. Hossein Mousavinezhad, editors. Mobile and Handheld Computing Solutions for Organizations and End-Users, ISBN: 1-466-62785-9, IGI Global, 2012. It includes 20 chapters, 53 authors, and 7 sections: (1) Location-based services (LBS), (2) Mobile security, (3) Mobile evaluations and analyses, (4) Mobile human computer interaction (HCI), (5) Mobile health, (6) Mobile green computing, and (7) Mobile applications and networks. Wen-Chen Hu and Naima Kaabouch, editors. Sustainable ICTs and Management Systems for Green Computing, ISBN: 1-466-61839-6, IGI Global, 2012. Including 18 chapters, 48 authors, and 5 sections: (1) information and communication technologies and systems, (2) management and manufacturing, (3) mobile handheld devices, (4) computer vision and image processing, and (5) education and power generators. Naima Kaabouch and Wen-Chen Hu, editors. Energy-Aware Systems and Networking for Sustainable Initiatives, ISBN: 1-466-61842-6, IGI Global, 2012. Including 17 chapters, 64 authors, and 4 sections: (1) computing systems and clusters, (2) wireless networking, (3) routing and networking, and (4) computer and processor design and implementation. Wen-Chen Hu, editor. Emergent Trends in Personal, Mobile, and Handheld Computing Technologies, ISBN: 1-466-60921-4, 20 chapters, IGI Global, 2012. This book offers a vital compendium of the latest research within the field of personal computing, highlighting the latest trends in research and development of personal technology. Wen-Chen Hu and Yanjun Zuo, editors. Handheld Computing for Mobile Commerce: Applications, Concepts and Technologies, ISBN: 1-615-20761-9, IGI Global, 2010. Including 200,000+ words, 22 chapters, 71 authors, and 4 sections: (1) handheld computing for mobile commerce, (2) handheld computing research and technologies, (3) wireless networks and handheld/mobile security, and (4) handheld images and videos. Wen-Chen Hu. Internet-Enabled Handheld Devices, Computing, and Programming: Mobile Commerce and Personal Data Applications, ISBN: 1-591-40769-9, Information Science Reference, 2008. Including 100,000+ words, 14 chapters, and 3 sections: (1) mobile commerce systems and handheld devices, (2) mobile web content design and implementation, and (3) client-side handheld computing and programming. Wen-Chen Hu, editor. Selected Readings on Electronic Commerce Technologies: Contemporary Applications, ISBN: 1-605-66097-3, Information Science Reference, 2008. Including 371 pages, 34 chapters, 76 authors, and 6 sections: (1) fundamental concepts and theories, (2) development and design methodologies, (3) tools and technologies, (4) utilization and application, (5) critical issues, and (6) emerging trends. Tom O’Neil and Wen-Chen Hu, editors. Proceedings of the 40th Annual Midwest Instruction and Computing Symposium (MICS 2007), Grand Forks, North Dakota, April 20-21, 2007. Including 71 articles, 115 authors, and topics of computational intelligence, algorithms, Web applications, software engineering, robotics, networks, distributed computing, tools for instruction/production, social implications, computational intelligence, programming languages, computer security, etc. Wen-Chen Hu, Chung-wei Lee, and Weidong Kou, editors. Advances in Security and Payment Methods for Mobile Commerce, ISBN: 1-591-40345-6, Idea Group Publishing, 2005. Including 352 pages, 14 chapters, 37 authors, and 4 sections: (1) fundamentals of mobile commerce security and payment methods, (2) mobile commerce security, (3) mobile commerce payment methods, and (4) ad hoc mobile commerce security and payment methods. 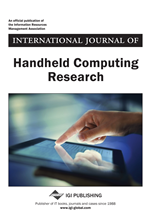 Editor-in-chief of the International Journal of Handheld Computing Research (IJHCR), November 01, 2008 to December 2017. 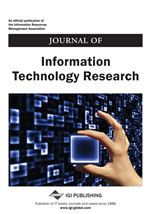 Associate editor of the Journal of Information Technology Research (JITR), October 3, 2007 to present. Editorial advisory board of the Contemporary Management Research, July 01, 2005 to present. Editorial advisory review board of the IGI Global, January 01, 2007 to present. 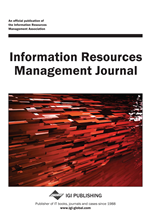 Editorial review board of the Information Resources Management Journal (IRMJ), May 1, 2008 - present. 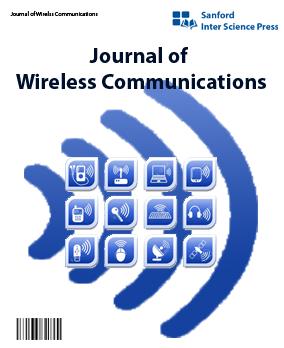 Editorial board member of the Journal of Wireless Communications (JoWC), November 01, 2015 - present. 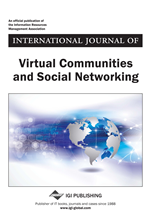 Associate editor of the International Journal of Virtual Communities and Social Networking (IJVCSN), May 01, 2009 - present. International advisory board member of the Encyclopedia of Information Science & Technology, January 2008 - present. Spatial trajectory prediction requires a complicated processing of routes (lists of locations) such as travel route collection, storage, indexing, transmission, and matching. This research makes spatial trajectory prediction simple and effective by using an innovative matrix representation for routes. At the same time, user privacy is fully protected because the matrix representation allows the trajectories to be predicted at the mobile clients instead of the server. By using our method, travel route processing becomes matrix processing, which is well documented and includes a variety of tools and methods. This research is useful and popular and is related to a couple of subjects such as mobile computing and security, location-based services, and human behavior recognition. Inertia has a moving object follow a path or trajectory that resists any change in its motion. Human travel patterns normally have the similar inertia feature. For example, the vehicles on a highway usually stay on the highway or people tend to walk towards a popular destination such as a mall or park. This research proposes a location-based service, spatial trajectory prediction, which is to predict the forthcoming locations of the human travel routes. It could be used in a variety of purposes such as travel recommendations and traffic control and planning. 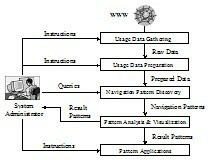 The proposed method is based on the previous traffic flows, a weighted graph. It predicts the spatial trajectory by finding a path with a maximal weight and within a length. A modified algorithm of the longest path is used to find the maximum-weight path. If the length of the path is over the limit specified by the user, the next maximum-weight path is used and the length is checked again. The process is repeated if necessary. Experimental results show the proposed method works, but further tests are needed to validate its effectiveness. 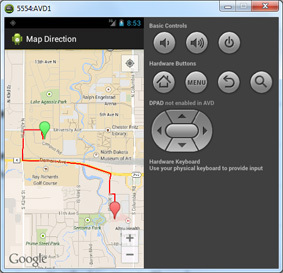 Map navigation is one of the most popular applications used by mobile users. To save the transmission time and reduce the delay, online mobile map navigation caches or prefetches maps by using various methods such as most-recently used and first-in, first-out algorithms. However, the mobility and location features of mobile users are usually left out by these methods. Caching and pre-fetching maps based on a mobile user’s locations would greatly reduce the transmission time and hence the battery power consumption. For example, if a user is visiting a town, prefetching the maps of nearby interesting stores and caching the maps of the visited, neighboring landmarks would help the user’s visitation and save the transmission time. The number of smartphone sales is expected to surpass the one of PCs and servers in the near future and it is predicted that more people will use smartphones than PCs or notebooks to browse the Internet in 2013. Despite the bright future of smartphones, they are not without problems, especially the short battery life. This research tries to relieve the problem by using location-aware online map caching and prefetching for saving battery power. Since the introduction of iPhone in 2007, smartphones have become very popular. The high mobility of smartphones has created many applications that are not possible or inconvenient for PCs and servers, even notebooks. One of the mobile applications, location-based services (LBS), has attracted great attention recently. This research proposes location-based research, which uses location information to find route anomalies, a common problem of daily life. For example, an alert should be generated when a school bus misses part of a route. Different kinds of route anomalies are discussed and various methods for detecting the anomalies are proposed in this research. The major methods use a technique of incremental location search, which finds matched routes as the search route is entered location by location. 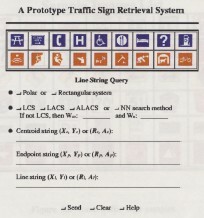 An alert is generated when no matched routes exist. Preliminary experiment results show the proposed methods are effective and easy-to-use. Handheld devices like smartphones must include rigorous and convenient handheld data protection in case the devices are lost or stolen. 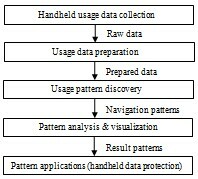 This research proposes a set of novel approaches to protecting handheld data by using usage pattern matching, which compares the current handheld usage pattern to the stored usage patterns. If they are drastic different, a security action such as requiring a password entry is activated. Various algorithms of pattern matching can be used in this research. Two of them are discussed in this research: (i) approximate usage string matching and (ii) usage finite automata. The first method uses approximate string matching to check device usage and the second method converts the usage tree into a deterministic finite automaton (DFA). Experimental results show this method is effective and convenient for handheld data protection, but the accuracy may need to be improved. The emergence of wireless and mobile networks has made possible the introduction of electronic commerce to a new application and research area: mobile commerce. Internet-enabled mobile handheld devices are one of the core components of a mobile commerce system, making it possible for mobile users to directly interact with mobile commerce applications. Much of a mobile user’s first impression of the application will be formed by his or her interaction with the device, therefore the success of mobile commerce applications is greatly dependent on how easy they are to use. This research first explains the role of handheld devices in mobile commerce systems and then discusses the devices in detail. A mobile handheld device includes six major components: (i) a mobile operating system, (ii) a mobile central processor unit, (iii) a microbrowser, (iv) input/output devices, (v) a memory, and (vi) batteries. Web usage mining is used to discover interesting user navigation patterns and can be applied to many real-world problems, such as improving web sites/pages, making additional topic or product recommendations, user/customer behavior studies, etc. This research studies and analyzes current web usage mining systems and technologies. A web usage mining system performs five major tasks: (i) data gathering, (ii) data preparation, (iii) navigation pattern discovery, (iv) pattern analysis and visualization, and (v) pattern applications. Each task is explained in detail and its related technologies are introduced and a list of major research systems and projects concerning web usage mining is also presented. The World Wide Web now holds more than 25 billion pages covering almost all daily issues. The Web’s fast growing size and lack of structural style present a new challenge for information retrieval. Traditional search techniques are based on users typing in search keywords which the search services can then use to locate the desired web pages. However, this approach normally retrieves too many documents, of which only a small fraction are relevant to the users’ needs. Furthermore, the most relevant documents do not necessarily appear at the top of the query output list. Numerous search technologies have been applied to web search engines; however, the dominant search methods have yet to be identified. 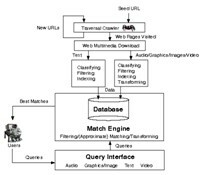 This research studies the existing technologies for web search engines and classifies them into six categories: (i) hyperlink exploration, (ii) information retrieval, (iii) metasearches, (iv) SQL approaches, (v) content-based multimedia searches, and (vi) others. Efficient storage and flexible retrieval are two principal needs in an image database. Image representation is the crucial factor in fulfilling these representations. This research proposes an image representation, including an image data structure and a spatial knowledge representation, that will facilitate the above two demands. The proposed data structure, called a line string, encodes an image via a string of linear skeleton and retrieves an image through string matching. The proposed spatial representation, called an OOLS, provides a structural and easy way to specify the line string in a database query. The research calculates the number of spatial relations held by a line string through a theorem. It also compares space needs and matching speed of line strings to other string data structures. It shows that a line string exhibits advantages over other structures but may require more storage and retrieval time. The Lisp and Prolog are two languages that are widely used for AI (artificial intelligence) development. However, both languages are not adequate for the AI researchers’ demands. As a result, an implementation which combines Lisp with Prolog would be extremely useful to AI researchers. 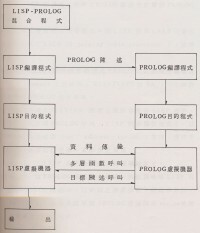 This research presents a basis for constructing multi-language programming environments which integrate the logic language of Prolog into the procedural language Lisp. First of all, we set up the software facilities of the system; they include a Unix-like editor, a Lisp compiler, a Prolog compiler, a heap storage management system, and a POPLOG virtual machine for which both compilers generate code. Then we combine the Lisp machine with the Prolog machine by transferring the data structure and the sequence control of a compiled mixed language program from one machine to the other. With this mulit-language system, a programmer can then freely use the Lisp or Prolog language to develop any software desired.